After a few year hiatus due to damage from forest fires, the Signal Peak Challenge officially resumed in 2016. More than a race, this is an experience that will occur over several days, starting on September 1, 2018 and going to September 3, 2018. The challenge will include a few shorter rides, a potential night ride, camping, a cookout and the main race on Sunday, September 2, 2018. On Monday, September 3, 2018 the infamous Honey Badger will lead out a group adventure ride to Sapillo Campground and back. Most importantly, it will be a whole lot of fun in the beautiful Gila National Forest with friends, family, and acquaintances both new and old. Also, the theme for 2018 is "Signal Peak The Next Generation," so feel free to bring your "Star Trek" best to this race for even more enjoyment. You'll begin to tackle this beast as a young padawan at the Signal Peak Parking area. Hang a left up the doubletrack road that exits the parking area. This will consist of a short but challenging climb with a couple of technical slick rock sections. This trail will intersect Meadow Creek Road. Turn right on the road and head up the road until you see another doubletrack trail on your right. Take this old logging road until it ends on the Signal Peak Road. Turn left and begin a brutal, several mile climb up Signal Peak. Near the summit of the peak, you'll notice a gate across the road. Hang a left away from the gate and begin the singletrack portion of this race. You'll initially be on the Black Peak Trail, a rough and rocky trail that has been a bit overgrown with cat claw. Seriously, this is a technical section, so use caution. Eventually, the trail will become a bit easier and you'll be met with a glorious downhill bomber run as you ride through the Aztec Park (AKA "The Holy Trail") section of this race. 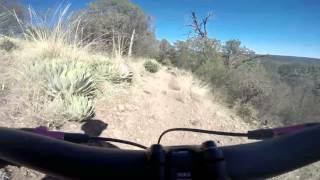 This is possibly one of the best downhill singletrack experiences in Southwestern New Mexico. Continue along the Continental Divide Trail until you reach Meadow Creek Road. Instead of taking the road back up to Highway 15, follow it down a bit until you see the Scout Camp Singletrack. Continue along this trail for a robust and technical climb along a creek, complete with a couple of tough creek crossings. Eventually, the trail will end near the beginning of Meadow Creek Road, near where it intersects Highway 15. Just prior to the intersection, hang a right on the doubletrack road and follow it around and over the highway. At this point, the trail will alternate between single and doubletrack with a few more climbing and descending sections that are technical in nature. Eventually, the trail will merge with the lower part of Tadpole Ridge Trail #232 and end on Highway 15. At this point, simply go up the highway and back to the parking area to return a mountain biking Jedi.